Bishop Skip Adams will lead a Day of Meditation, Reflection and Quiet on Saturday, March 30 from 10 am to 2 pm on James Island in Charleston, sponsored by the Palmetto Chapter of the Society of the Companions of the Holy Cross. "Where Are You, God? When Life Challenges Faith" is the theme for the day. The retreat will take place at the Convent o fthe Sisters of Charity of Our Lady of Mercy, 424 Fort Johnson Road, Charleston SC 29412. A light lunch will be served for a small donation. For information and to register, contact Betsy Luke at 843-224-0419 or bluke544@gmail.com. Many churches offer opportunities during Lent for people to prepare to be Confirmed, or received into the Church, or to reaffirm their baptismal vows. Please contact any of our churches to learn more. Church of the Messiah, Myrtle Beach offers a weekly discussion of the book of Ecclesiastes. The group meets at 6pm for dinner at the home of Charlie and Amy Jordan with a discussion following at 6:45. The weekly study ends with Compline at 8:00. For more information please email Charlie Jordan at cjordan@pearcelawgoup.com. Calvary, Charleston invites people in the downtown area to gather as a community for a noonday prayer service on Wednesdays during the season of Lent, a time of meditation and fellowship. All are welcome. Church of the Holy Communion, Charleston will offer Stations of the Cross each Wednesday at 12:30 pm. All Saints, Hilton Head Island offers a five-week Lenten supper and program series with supper at 6 pm and a presentation and discussion at 6:45 led by the Rev. Dr. John D. Stonesifer and the Rev. Pam H. Fahrner. Each evening will end by 8 pm with a brief worship service. March 20: "Learn" and "Pray"
March 27: "Worship" and "Bless"
April 3: “Go” and “Rest"
Two times on Wednesdays starting March 20: 10 am or 6:30 pm. St. Mark's, Port Royal is offering a unique 'bus trip' during Lent, reading The Great Divorce, one of C.S. Lewis’s most beloved books. Though it is diminutive in size, it is powerful in its message of repentance and renewal. For the evening study, a simple, savory, soup supper will be served swiftly at 6 pm. "The Five Seasons of Prayer"
The Episcopal Church on Edisto – How do we make sense of prayer? Are some prayers more effective, and by the way, when we say prayers out loud where do they go anyway? For such a well-known part of our church life, praying is a mystery. In five sessions participants will study written, sung, silent and corporate prayer, and even write their own. Each 40-minute session will be followed by lunch. "Nature and Living Our Faith"
Epiphany, Summerville: will have a Lenten Soup Supper and teaching on nature and living our faith between Sundays. All are welcome. Church of the Messiah, Myrtle Beach will join with St. Philip Lutheran Church for Dinner Church and reflect on "Jesus' Dinner Table," stories of our Lord at table and the bounty of his teaching. St. Catherine's, Florence will join with Cross and Crown Lutheran Church to offer a light supper with international themes at 6 pm followed by an evening service at 7 pm during Lent. Good Shepherd, Summerville is merging the tradition of its Lenten Wednesday night supper and Bible study withits newly established mid-week Eucharist. Enjoy a simple supper with friends followed by Eucharist and table discussions of the Lectionary. St. George's, Summerville: Based on the Third Chapter of St. Peter’s First Epistle, this teaching series will be taught by the Rector, the Very Rev. Chris Huff. Each evening will begin with a soup supper and fellowship. A nursery is available. The word on the street is that our nation is more divided economically, socio-politically and culturally than ever before. You can feel the stress and strain at almost every seam of our national fabric. While the Church used to be a unifying factor in our society, her voice has been sidelined from the Public Square. Who, then, informs how we should live? The First Epistle of Peter declares that our job as followers of Jesus is to be a blessing in every context of life. Fr. Chris will draw from examples of life, music, cinema and song, showing what “being a blessing” should look like in every age… especially in 2019. Grace Church Cathedral, Charleston offers a book study led by Dean Michael Wright outlining Christian belief and practice. St. Mark's, Charleston will offer an Instructed Eucharist, followed by supper at the Parish House. St. Thomas, North Charleston: Each program will begin at 6:00pm with a potluck supper, followed by worship and program. All are welcomed. Grace Church Cathedral, Charleston offers an exploration of St. Paul's theology of the cross in his epistles to the early Christian community, led by Dean Michael Wright and the Rev. Canon Caleb Lee. Grace Church Cathedral, Charleston offers a weekly study on the use and meaning of symbols that make up our worship and sacramental life, led by Dean Michael Wright. Good Shepherd, Summerville: Death is a part of life from which none of us can escape. We deal with the death of friends and family members during our lifetimes; and each of us must eventually die. Led by Michael Szymanowski, the goal of this class is that, in facing death as a fact, we may claim this gift of life more fully. Topics will include how to deal with grief, what Scripture says about life after death, how to celebrate a life even at the time of death, helping children with the topic of death, how to help others who are grieving, practical advice on funeral planning – and more. 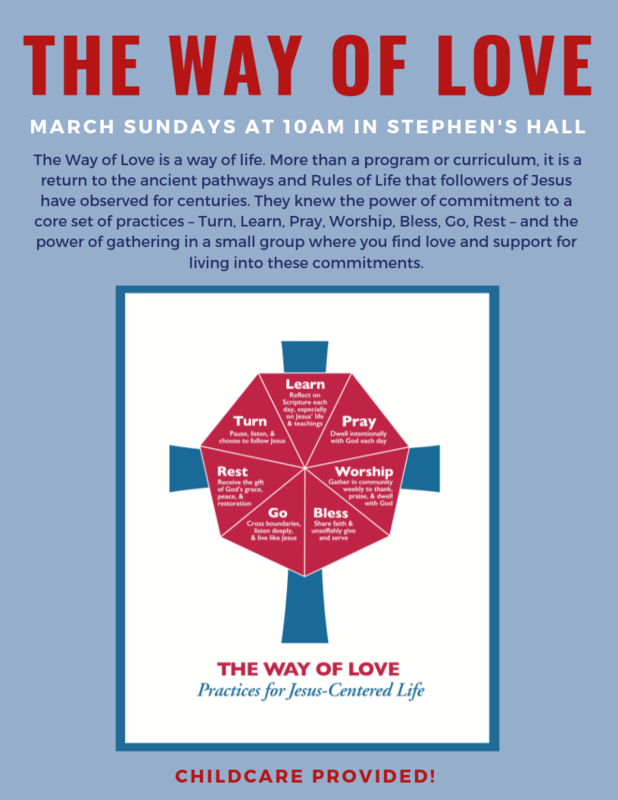 St. Stephen's, Charleston: The Way of Love is a way of life. More than a program or curriculum, it is a return to the ancient pathways and Rules of Life that followers of Jesus have observed for centuries. They knew the power of commitment to a core set of practices – Turn, Learn, P ray, Worship, Bless, Go, Rest – and the power of gathering in a small group where you find love and support for living into these commitments. Meet each Sunday in St. Stephen's Hall. Child care is provided. Find a flyer here. Grace Church Cathedral, Charleston: Explore the classic theeological and biblical themes of Lent and where we can find them in real life, using examples from contemporary society throuh video clips and other media. Led by the Rev. Canon Caleb Lee nad vestry member Josh Corrigan. The Order of St. Helena, a women's monastic community in The Episcopal Church, offers Silent Weekend Retreats at the convent in North Augusta, SC, with the next retreat planned for March 15-17. Silence begins after Compline on Friday and continues through Eucharist on Sunday. A donation of $160 includes all meals and one optional spiritual direction session. Three more retreats are offered later in 2019. Find details and registration here. The Community of St. Mary in Sewanee, Tennessee, is offering a quiet day in preparation for Holy Week called “Lazarus, Come Out: Reflections on John 11,” led by New Testament scholar and poet Bonnie Thurston. Read more about the event here. Online registration is available here. Each year at Lent, people worldwide participate in Lent Madness, the “saintly smackdown” in which 32 saints do battle to win the coveted Golden Halo. Calling itself the world’s most popular online Lenten devotion, Lent Madness brings together cut-throat competition, the lives of the saints, humor, and the chance to see how God works in the lives of women and men across all walks of life. 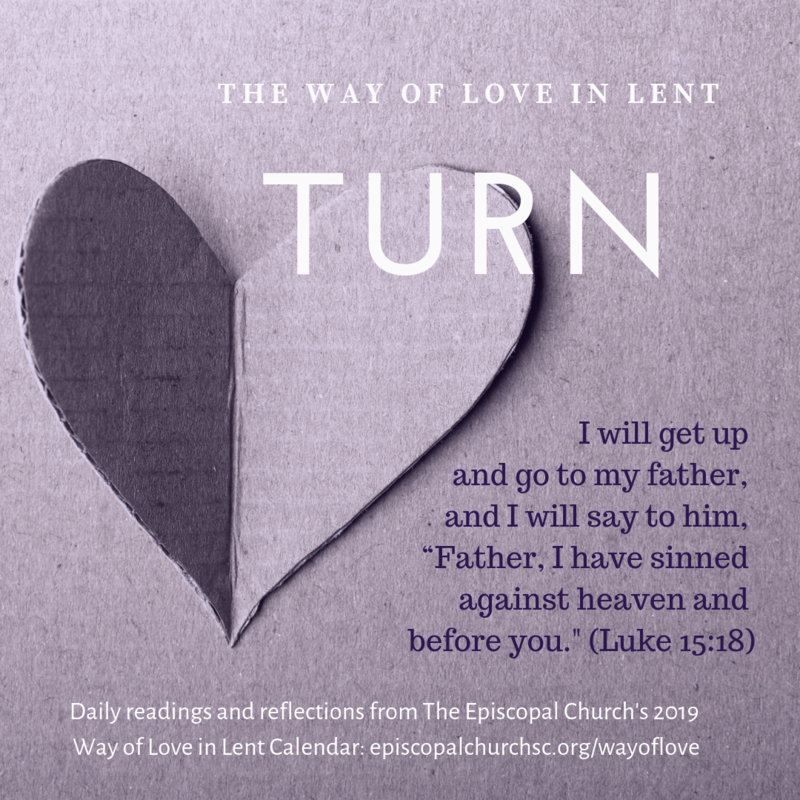 Visit our Facebook page and Instagram feed to see our daily posts from The Episcopal Church's "Way of Love in Lent" calendar. Download the calendar and find other Way of Love resources here. Looking for a Lenten program of study, prayer or reflection for a group or for yourself? The Episcopal Church has posted a page filled with resources and curricula. Included is "Life Transformed: The Way of Love in Lent," based on the Way of Love introduced by Presiding Bishop Michael Curry at the last General Convention. Episcopal Relief & Development offers daily meditations for the season of Lent, available in print, or as a daily email. Find out more and subscribe to the daily meditations at this link. Presiding Bishop Michael Curry has called on Episcopal churches and dioceses to support the ministry of our Anglican sisters and brothers throughout the Province of Jerusalem and the Middle East with a special Good Friday offering. Visit this link to read a letter from the Presiding Bishop, and find bulletin inserts and other resources for the Good Friday offering.